ConvergCom is helping build the foundation for high performance IT networks and systems by installing the highest of quality network cabling in the Orlando area as well as the state of Florida and nationwide. 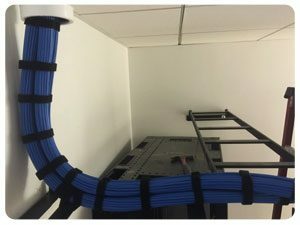 Network Cabling and Structured Cabling are the cornerstone of our business. With over three decades of experience, ConvergCom has both the longevity and stability to meet your needs today and tomorrow. ConvergCom is a premier installer of top quality voice, data, fiber optic and audio/video cabling products. We perform any low voltage cabling service including installing Cat5e, Cat6, fiber optic, telephone, A/V, and wireless (wifi) networks. If your Orlando area business or office needs help with data cabling our personnel, extensive experience and guiding principles, make ConvergCom an excellent choice to be your structured network cabling contractor. Your business network relies on voice and data traveling through scores of cables to communicate for both internal and external purposes. With an emphasis on complete customer satisfaction, system performance and attention to detail we take pride in each of our installations. Offering design build and project management services, we work closely with each customer to ensure that their cable infrastructure needs and expectations are met or exceeded. Call us today at 407-324-3432 or contact us here to see the ConvergCom difference. Your network cabling needs are important to us! Whether you're looking for voice and data cabling, fiber optic cabling, wireless networking or other infrastructure solutions, ConvergCom is here to help.